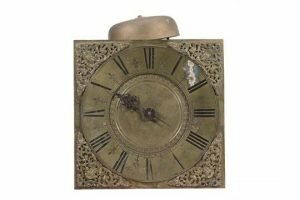 A George II thirty hour longcase clock movement and dial, John Ettery, Horton, mid 18th century, the single-handed posted count wheel bell striking movement with anchor escapement and 9.75 inch square brass dial with concentric button ring turned band to the matted centre. 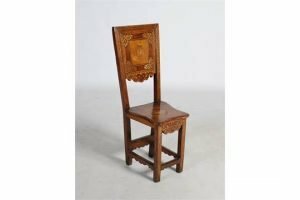 A 19th century Continental walnut and marquetry inlaid hall chair, the rectangular inlaid panel back decorated with a figure wearing bi-corn hat, within a scroll and chequer banded border, the shaped rectangular seat raised on four square supports united by stretchers. 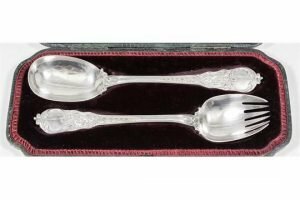 A pair of late Victorian silver salad servers, the shaped handles with reeded mounts, scroll and leaf cast terminals, by Holland, Aldwinckle & Slater, London 1898. 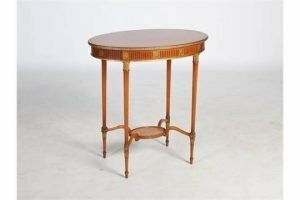 An early 20th century satinwood and parcel gilt oval shaped occasional table, the cross banded top above an arcaded frieze divided by patera, raised on four reeded tapered cylindrical supports united by stretchers and an oval under tier. 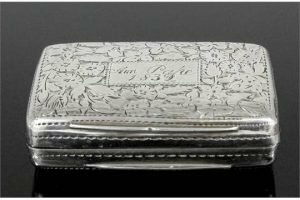 A William IV silver rectangular vinaigrette, the lid and base engraved with leaf and floral ornament, the gilt interior with pierced and engraved flowerhead and leaf scroll pattern grille. 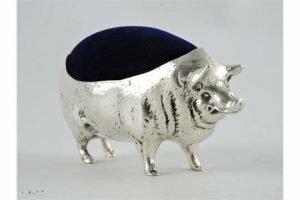 A large white metal pig pin cushion with blue velvet lining. 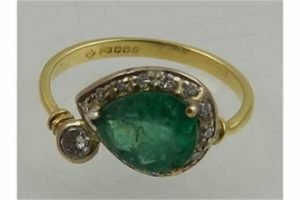 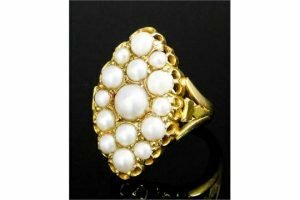 An early 20th Century 18ct gold and seed pearl dress ring of Victorian design, the ovoid face set with fifteen half pearls. 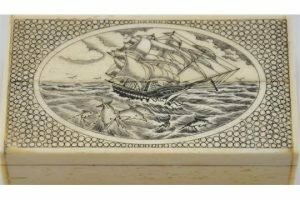 A Scrimshaw style engraved bone snuff box decorated with a clipper in full sail. 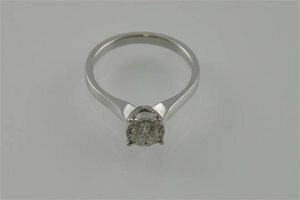 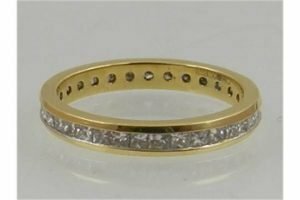 An 18 carat white gold solitaire diamond ring the claw set stone 0.34 carat. 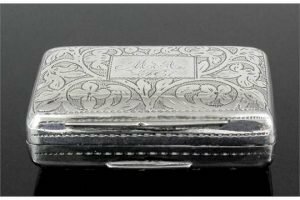 A William IV silver rectangular vinaigrette, the lid and base engraved with floral and leaf scroll ornament, the gilt interior with pierced and engraved floral and leaf scroll pattern grille. 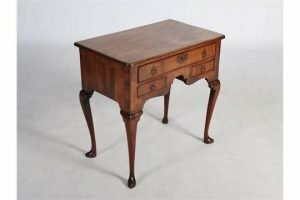 A George III mahogany low boy, the rounded rectangular top with a moulded edge, above a long cockbeaded frieze drawer and two smaller drawers, raised on four cabriole supports with tapered pad feet. 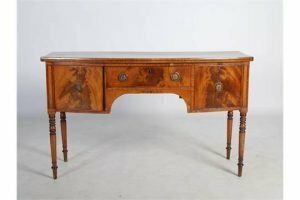 A George III mahogany bow front sideboard, the shaped rectangular top above a central cockbeaded drawer flanked by cupboard doors, raised on four ring turned tapered cylindrical supports. 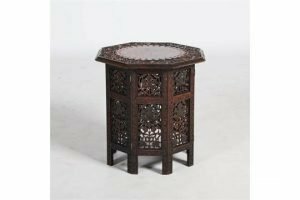 A late 19th/ early 20th century Eastern carved wood and brass inlaid octagonal shaped occasional table, on a pierced folding base which has been fixed into position. 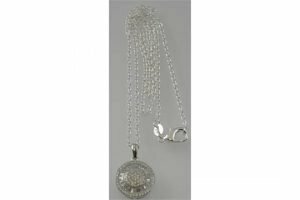 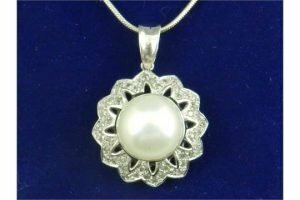 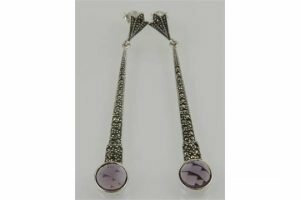 A silver and cubic zirconia pendant necklace on silver chain. 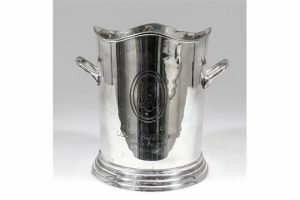 A Louis Roederer two-handled silver plated champagne bucket, 9ins high, engraved with the monogram “L.R.” within a twin oval cartouche above the inscription “Louis Roederer Fonde en 1776”. 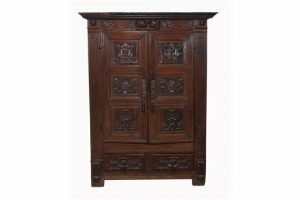 A Continental carved oak cupboard, mid 18th century, the tablet moulded frieze carved with cherub masks, the pair of panelled doors carved with masks and foliage, above a pair of drawers and flanked overall by fluted pilasters.